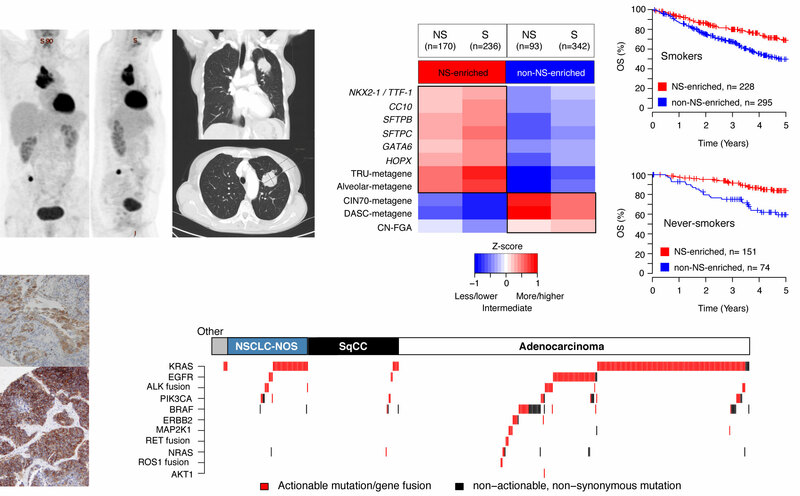 Lung cancer, the leading cause of cancer death, is divided into histological subtypes with large differences in molecular alterations, clinical presentation, and patient outcome. By a combined clinical and molecular approach we focus on improving the molecular understanding of lung cancer and translate research findings into a clinical diagnostics. By characterization of the genomic, transcriptional, and DNA methylation landscape in different lung cancer subgroups in both own and public cohorts we search for new molecular subgroups of potential clinical relevance, additional targets for synergistic treatment, prognostic and/or predictive markers of relapse or response to therapy, and a deepened understanding of the molecular pathogenesis. By analysis of patient specific alterations in circulating tumor DNA in blood samples we aim to establish blood-based assays for early detection of lung cancer, treatment monitoring, and early detection of relapse in the primary and advanced setting. Zhang, R., Lai, L., He, J., Chen, C., You, D., Duan, W., Dong, X., Zhu, Y., Lin, L., Shen, S., Guo, Y., Su, L., Shafer, A., Moran, S., Fleischer, T., Bjaanæs, M. M., Karlsson, A., Planck, M., Staaf, J., Helland, Å. & 4 othersEsteller, M., Wei, Y., Chen, F. & Christiani, D. C., 2019 Jan 31, In : Epigenetics.